CAUTION : OBJECTS IN PICTURES MAY BE STEEPER THAN THEY APPEAR. The first mile is actually 0.9 of a mile and has about a quarter mile of flat at the start. Don’t go out too hard, because you will pay for it further on up the hill. The grade increases a little and stays that way to the top. You’ll get used to the uphill grind if you run smart and don’t worry about what the people around you are doing. The grade until the one mile mark doesn’t really change much. The 1 mile mark is on the left side of the road right after the 2000 ft marker. Mile 2 is possibly one of the toughest on the course. There are a couple of flat sections where you will find a water stop, but you will also find sustained inclines around 17%. You are still below tree line during this mile which provides shade on cool days but can trap heat on warmer days. Once again don’t get caught up in what pace everyone else is running. You may find though that you are reeling in people that went out too fast by the 2 mile mark. The 2 mile mark is on the right side of the road. Mile 3 has a couple of steep sections, but maintains a steady 12% grade most of the time. You will notice that trees are starting to get a little shorter at this point. Nothing special during this mile. You may notice that you are getting tired if you haven’t already (Really insightful, I know). The 3 mile mark is on the left side of the road. Mile 4 is home to one of the more mentally demanding points in the race. There is a straightaway that looks to be endlessly long and uphill. This stretch is not any steeper than the rest of the road, it’s just mentally daunting. After completing this stretch you’ll find the halfway mark. Don’t expect your second half time to be anywhere near your first. The 4 mile mark is around a left hand turn above tree line on the right side of the road. Watch for the wind as you come around. It’s usually in your face. 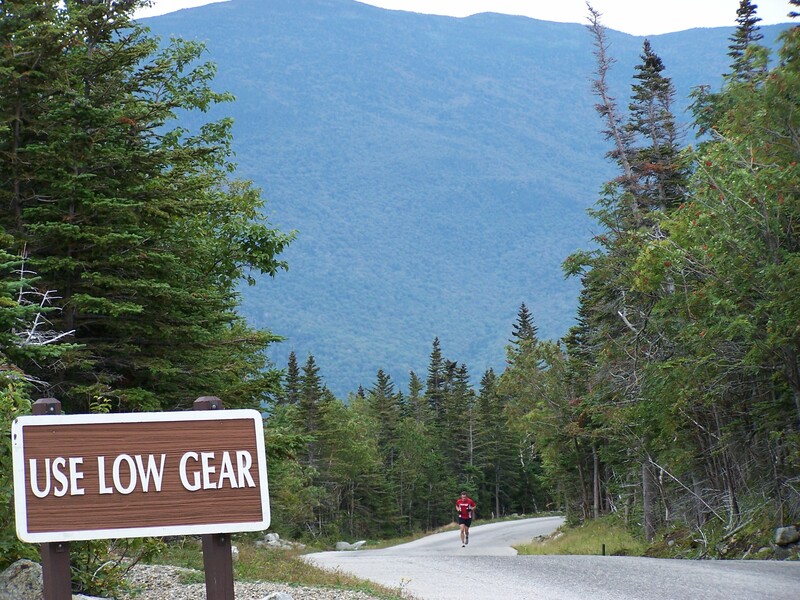 Mile 5 is known for a long stretch of steep gravel above tree line. After the 4 mile mark the road zig zags back and forth and even flattens out in one of the parking lots. Once you reach the gravel the road steadily climbs to the 5 mile mark. The terrain falls off on the left side of the road down into Pinkham Notch. The 5 mile mark is near the end of the grade before you reach the Cragway Turn. You will find the marker on the left side of the road. If you look up the gravel stretch from the flat section you can make out the 5 mile mark in the distance. Most of mile 6 is a long grind on gravel after you round the Cragway Turn. You will find that there is very little vegetation to shelter you from the wind. Most of the gravel is well packed, so traction is usually not a problem. 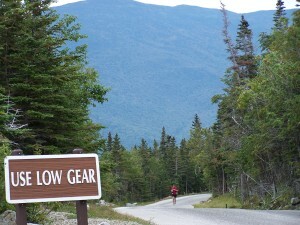 The 6 mile mark is on the right side of the road overlooking the Great Gulf Wilderness. The hardest part of mile 7 is the infamous Sheep’s Back hairpin. This is the spot where Kenyan master Andrew Masai walked in 2003 while in 2nd place and never recovered. Most of mile 7 is gravel with a few stretches before the hairpin that are paved. After the hairpin the road is paved to the top. One of the few flat stretches during the race is found after the hairpin known as the Cow Pasture. At this point you are quite aways above tree line and exposed to the elements. The last 0.6 miles is just as hard as the previous 7 miles. Once you reach the 7 mile marker you will probably start to see a few spectators and cars. You can smell and hear the Cog Railway and the buildings on the summit. When you round the penultimate corner you will think you are done until you see a 22% grade staring you in the face, waiting to add insult to injury. Once you find you way up this last stretch you can cross the finish line knowing you have completed one of the most grueling road races in the world. Congratulations. Enjoy the view while you’re there, if there is one. This is spot on. Hoping to win the lottery this year! No words can describe how tough this race is. You can plan all you want about what you are going to do during the race but after the first mile you just want to finish, time be damned. The trick is to have some strategy, though. You may want to go at a steady pace before the half way mark and then walk some or just race walk. I was ,”running” at the 5 miles mark and some speed walker besides me was at my side the whole time! One mistake you shouldn’t make it to take it easy the whole way. Give it your best and be exhausted at the end and then you can be proud of yourself. Pretty accurate . First timer here . Hardest race of my life. There has never been a race that has brought me to tears , physically and emotionally . This was it . I will return.